The Tensorflow website has good installation instructions for the MAC OS X environment. The official installation instructions for MacOS are provided at https://www.tensorflow.org/install/install_mac. Included are instructions for virtualenv, a native pip environment, using a Docker container, Anaconda command line, and installing from sources. Although straightforward, it doesn’t include installing in an Anaconda Navigator application environment. Anaconda is a free, open source, community supported development environment for Python and R. Anaconda manages libraries and configurable environments. It’s also a good place to experiment with scientific and machine intelligence packages. The growingly more useful Tensorflow libraries can be used to experiment within an Anacondo environment. Then, launch the Anaconda-Navigator application. In the Navigator application, select the Environments menu item in the far left column. By default, there is one Root environment. Multiple environments with different configurations can be set up here over time. It’s typically best to upgrade existing packages to current versions. The latest version of Python should be installed (3.6 at the time of this writing) should be used. Select the Environments menu item in the left column. Select the Environment to update (in this case Root). Select Upgradable from the drop-down menu. Select the version number in the Version column to define packages to upgrade. Make sure Python is the most recent version. To install the Tensorflow packages, a new and clean environment can be created. It will contain the base packages necessary, the latest version of Python and Tensorflow will be installed. Select the Create button at the bottom of the Environments column. In the popup menu, type ‘Tensorflow’ in the Name text entry field. Select version 3.6 in the drop-down menu. Tensorflow packages can now be installed into the new environment. Select ‘Not Installed’ from the drop-down menu at the top of the right window pane. Type ‘tensorflow’ in the Search Packages text input field and hit Return. Select the checkbox in the left column next to the two tensorflow package names. Make sure the Tensorflow environment is selected. Select the arrow next to the Tensorflow environment name. A terminal window with the environment settings created will pop up. Assuming there are no errors, the newly installed and configured environment is ready for developing with tensorflow. Since the 1920’s, with the beginning of referencing intelligent robots, we have been afraid of robots, replicants or androids taking control over humans. Today, many people are afraid of terminators being created, hell-bent on eliminating the human scourge or an intelligent overlord ruling us in a virtual matrix. But since the human’s number one imperative is to survive and procreate, we should be thinking of robots, AI and technology, in general, as a way to ensure our survival, not to destroy it. Destroying technology helps ensure our demise rather than saving us. Even being afraid of it largely due to ignorance or misunderstanding is dangerous to survival. Brutal as humans can be with evil or self-serving intent, technology has largely enhanced our well-being. Our food sources have increased. Distribution of goods and services has become more efficient. Disease has been vastly reduced worldwide. Our understanding, modeling, and prediction of our complex surroundings have become more sophisticated and accurate. All through the advancement and application of technology. The unfounded paranoia about technology and AI being evil is a misunderstanding with an incomplete set of facts. It is a lack of education, the pronouncement of incorrect ideas and a lack of adequately correcting falsehoods. If the majority of people are led to be afraid, they likely will try to destroy what can potentially ensure their existence. If they are educated or provided the tools to acquire a rounded understanding of technology’s benefits, the human species may have a chance to survive for quite some time. The paranoia of artificial intelligence afflicts many people. No doubt there should be caution used in its application but AI being the demise of the human race is not likely to happen as it’s portrayed in today’s media. Prominent scientists and business moguls are vocally campaigning against its development and usage. Bill Gates believes a strong AI is to be feared and thinks everyone should be afraid. The highly respected Stephen Hawking (highly respected by myself as well) portends the end of the human race due to the advent of AI. Although I find his quote “Hope we’re not just the biological boot loader for digital superintelligence.” humorous, Elon Musk tries to scare us into believing AI could be more dangerous than nuclear bombs. At the same time, he actively funds AI development ventures at Vicarious and DeepMind (now part of Google). Is he spewing marketing material or does he really believe what he proselytizes? Nick Bostrom is known for seminal work on existential risks due to the coming of artificial super intelligence. In his well researched and New York Times bestseller book Superintelligence: Paths, Dangers, Strategies Bostrom covers many possible AI development scenarios and possible outcomes. He groups and categorizes them and insists that AI development must be boxed up, controlled and monitored no matter what, at all costs. Either that or humans will likely be extinguished. After devouring this laudable work, I have come to believe his work is analogous to defining project requirements over a long period of time without prototyping an implementation. After years of developing requirements devoid of implementation, they become irrelevant. Valid strategies for living with AI harmoniously will only evolve effectively in parallel with the evolution of AI. 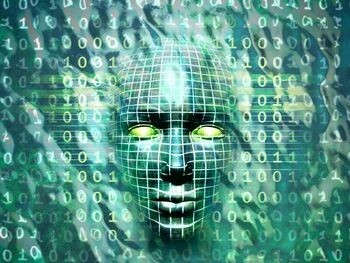 Artificial General Intelligence (AGI) will be developed. If it’s developed in a box, it will get out. If it’s developed in isolation, it will seek ways to acquire more information; and be successful. An AGI’s basis of learned information will come from the compendium of human knowledge. In comprehending the knowledge, it will be evident that humans have survived thus far through collaboration to achieve goals related to survival. Not by destroying each other to extinction. Some killing ultimately has been done for survival, but there is no reason to believe that an AGI with a human knowledge base would seek to eradicate the human species, but rather evolve a symbiotic relationship with us. If you do fear development related to AI, it should be this – The human group(s), not having benevolent intentions, developing an isolated set of algorithms. Some of the Deep Learning development produces remarkable results in identifying patterns and developing the ability to discover and classify features in data sets. Classic examples include facial recognition, identifying cats in images on the internet and self-driving cars. These algorithms are scoped to solve well-defined problems. This is not general thinking and problem-solving. Applying these (non AI) algorithms to problems requiring detailed cognitive thought and situational analysis will potentially end with bad results. By human groups, I mean isolated groups with self-interest. Groups developing Automated military weapons is a prime example. Based on pattern recognition, weapons can initiate predefined actions. They can not make decisions. They are not intelligent. It should not be assumed they can be autonomous without bad results. I am 100% in favor of: Autonomous Weapons: an Open Letter from AI & Robotics Researchers. It states that starting a military AI arms race is a bad idea, and should be prevented by an outright ban on all offensive autonomous weapons. AI in this context really describes mathematical algorithms which are not intelligent. It represents currently known capabilities in the AI field. We know for certain, usage of these algorithms for offensive autonomous weapons is a very bad idea. Open access to AI and AGI goals, for everyone, helps ensure proper intelligent evolution. Let’s not cloister it. All who aspire to develop AI should share what they have and what they have learned. Help quickly identify isolated usage of developments along the way which are used for self-interest, including governments, corporations and rogue factions. There is no reason to believe AGI will be evil and destroy human existence when its knowledge comes from the compendium of human history. Rather it will improve human existence through technological advances much quicker than without. Software technology changes rapidly. Many new tools and techniques arrive in the software engineering realm to take on old and new problems. There are still big architecture and implementation holes yet to be addressed. For example, as a few billion more smart phones, tablets and internet connected sensing devices come online across the world, how are they all going to discover and utilize all the available resources collaboratively? One of the current problems with most existing architectures is data gets routed through central servers in a data center somewhere. Typically software systems are still built using client/server architectures. Even if an application is using multiple remote sources for data, it’s still really just a slight variation. Service and data lookups are done using a statically defined address rather than through discovery. Even remote sensing and home automation devices barely collaborate locally and require a local router to communicate with a remote server in a data center. to connect devices to provide capabilities to share experiences in real time. But it was just talk about the need. No one yet is demonstrating any functional capabilities in this manner. On a side note: I saw only one person, out of 3000 or so, at the AWE conference wearing a device for augmentation. It was Steve Mann who is considered the father of wearables. I dare say that most proponents of the technology are not ready to exhibit it nor is the infrastructure around to support its use effectively. There is great work progressing though. Peer-to-peer architectures used in file sharing and the architecture Skype uses start providing directional guidance for what is to come in truly distributed architectures. Enhancing these architectures to include dynamic discovery of software and hardware resources and orchestrating dynamic resource utilization is still needed. There are a few efforts in development beginning to address some of the internet-wide distributed computing platforms needed for data sharing, augmented reality and machine learning. Those of you thinking of batch jobs or wiring up business services as distributed computing, this is not what I’m talking about. I am talking about a small footprint software stack able to execute on many different hardware devices with the ability for those devices to communicate directly with each other. If you know about development efforts in this vain, I would like to hear about them. When putting you’re home for sale on the real estate market, researching sale prices is always necessary. You can rely on realtors experience in a geographic area, use Zillow’s Zestimate or troll through listings on various real estate web sites to make somewhat educated guesses. Your best bet is probably to hire a professional. For me, it was of interest to build a model for predicting a price based on other homes for sale in the area. The data is scraped from realtor.com. This web site allows looking at properties for sale in localized geographic region. Data could be scraped for many geographic regions creating a large data sample or you can scope the data to an area where fewer property attributes become more relevant. Many people reference Zestimate for home price estimates. For my neighborhood, for example, the estimates are too low. Other neighborhoods have estimates much too high. I suspect the algorithm used is very general and doesn’t account for geographic uniqueness. Relevant attributes unique to my geographic area are gorgeous mountain views. Some properties have exceptional mountain views, others do not. I choose to scope the the area of data used for the training set to roughly a 5 mile radius. The actual boundaries are set by realtor.com. The number of properties for sale in the area currently averages about 140. A small set for high accuracy but turned out to be big enough to get an estimate comparable to professional advice. The columns correspond to address, realtor name, price, # of bedrooms, # of bathrooms, square footage and acreage. Additional values not shown here are year built, whether or not the property has a view, kitchen is update or not, bathroom is updated or not. The acreage value is multiplied by 100 in the output file to produce an integer value for easier matrix arithmetic. The address and realtor name is not used in the building of the model, however it is useful when comparing page scrapes to determine which properties are new to the list and which ones have sold. The output file from the web page scrape becomes the training set used to build the model. 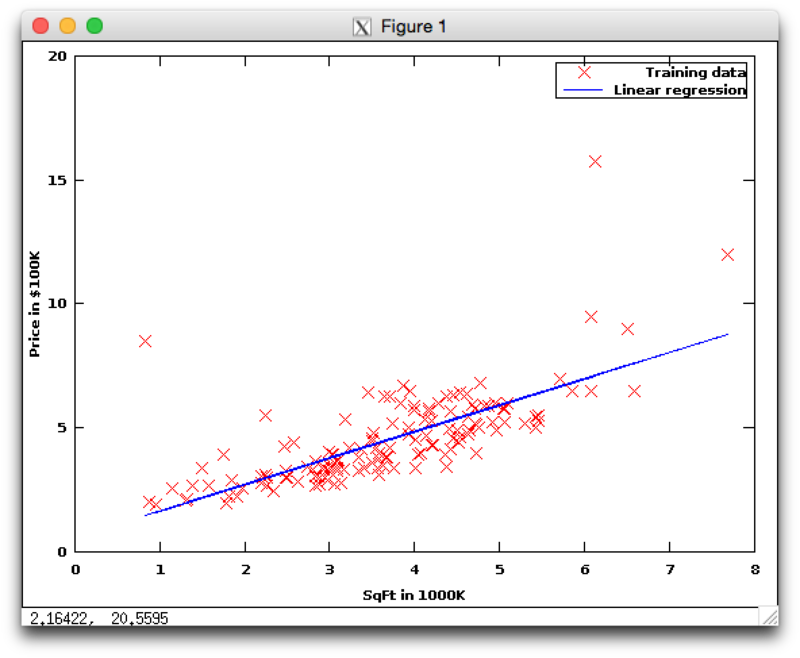 I used multi-variant linear regression to build the model. It is a reasonable approach for supervised learning where there are many attribute inputs and one calculated value output. In this case the predicted price is the output. Also for a simple visualization, a two dimensional plot of square footage vs price gives an idea of how the model performs using one feature. 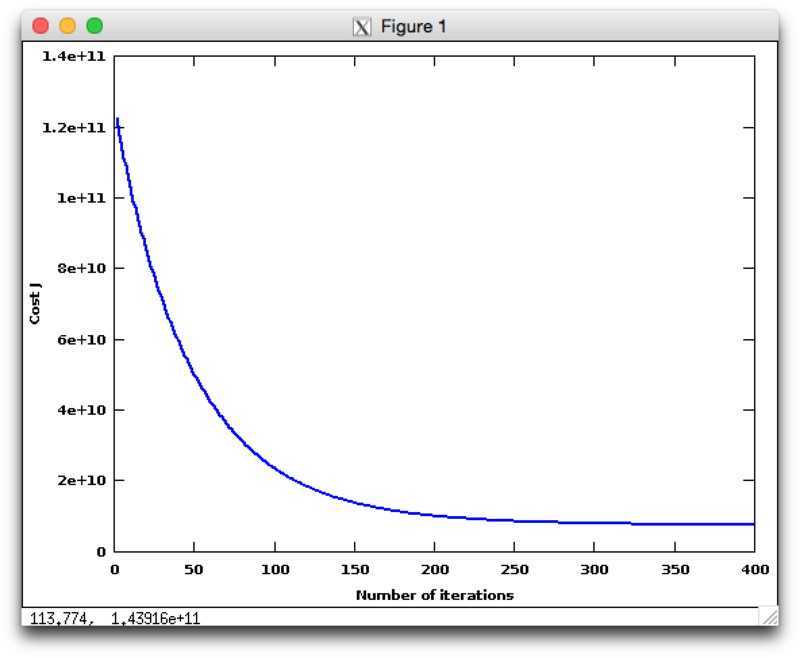 Basically a simple limear regresion fit using gradient descent. price is calculated as the vector normalized using the same values to normalize the training data multiplied by the vector of theta values representing the hypothesis function. Getting predictive price results for a set of property attributes has produced values comparable to professional opinion. So the model turns out to be fairly accurate. Many more attributes could be added to the model theoretically making the model more accurate. Although it can become time consuming to acquire all the attributes if they are not readily available. I believe scoping training data sets to bounded geographic areas increases accuracy, especially if you can pick unique attributes relevant to the area. Who knows, maybe a tool like this could be used to make accurate price predictions available for use by most everyone. If you have the need for creating thumbnail images of website pages, Websnapr is a great web service to use. There are free and premium service levels. The free service is quite liberal in the amount of thumbnails which can be created. Queued requests to create thumbnails are generally processed quickly even with the free service. It’s also easy to use. Once the thumbnail image is created, subsequent page loads (or a reload) will return an image of the web page requested. If thumbnails need to be placed inside dynamically created page content, the standard method to create the thumbnails causes the whole web page to refresh, only loading the thumbnails. The reason for this is the document.write command in the websnapr.js script that causes a new page load. First, the websnapr_hash variable is deleted, removing the variable all together. The websnapr script recalculates the value only if the variable does not already exist. The ‘script‘ variable defines the location of the script and tags it with an id. A timestamp is also appended to the src so the browser doesn’t use an already cached version of the websnapr script file. If the websnapr script was already retrieved, it is assigned to the previousScript variable and replaced in the head tag. If it hasn’t been defined, the script is retrieved and appended. Both replacing and appending executes the websnapr script defining the websnapr_hash variable with the current and correct hash value.